XMark Fitness Olympic EZ Curl Bar With Durable Nylon Bushings And Olympic Weight Set Packages with a 400 lb. weight capacity, this XMark Olympic EZ curl bar has chrome sleeves, 28mm grip with medium knurling and longer lasting nylon bushings. Customers describe XMark plate weights as exceptional. The one-piece high quality cast iron plates are hand crafted and inspected. A tough, premium rubber casing made from virgin and recycled rubber covers each plate. The recessed tri-grip handles have spacious openings fitting comfortably in the hand, are rounded with integrated finger slots and slotted for easy loading and offloading. The weight numbers are molded into each plate. The solid steel precision hub ensures a perfect fit on Olympic bars. 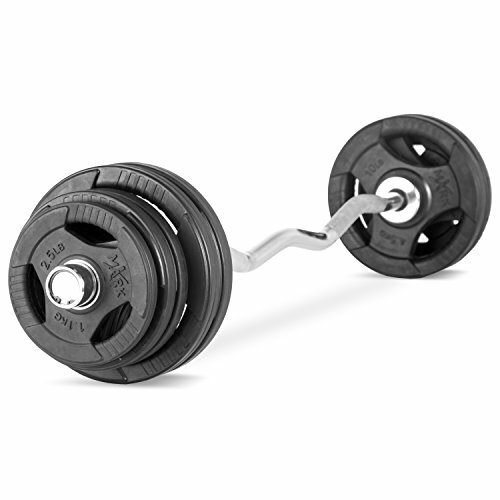 Package includes a XMark 28mm Olympic EZ curl bar with durable nylon bushings and a 65 lb. set of Olympic plate weights - Includes 2 Pair of 10 lb., 2 Pair of 5 lb. and 1 Pair of 2.5 lb. Customers describe XMark plate weights as exceptional. The one-piece high quality cast iron plates are hand crafted and inspected. A tough, premium rubber casing made from virgin and recycled rubber covers each plate.